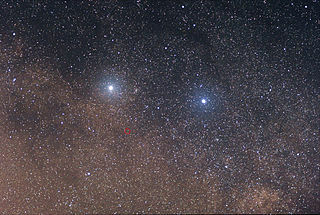 Alpha Centauri (α Centauri, abbreviatit Alf Cen, α Cen) is the closest starn seestem tae the Solar Seestem, bein 4.37 light-years (1.34 pc) frae the Sun. ↑ 1.0 1.1 1.2 1.3 1.4 1.5 1.6 1.7 1.8 1.9 Van Leeuwen, F. (2007). "Validation of the new Hipparcos reduction". Astronomy and Astrophysics. 474 (2): 653. arXiv:0708.1752  . Bibcode:2007A&A...474..653V. doi:10.1051/0004-6361:20078357. ↑ 3.0 3.1 Torres, C. A. O.; Quast, G. R.; da Silva, L .; de la Reza, R.; Melo, C. H. F.; Sterzik, M. (2006). "Search for associations containing young stars (SACY)". Astronomy and Astrophysics. 460 (3): 695–708. arXiv:astro-ph/0609258  . Bibcode:2006A&A...460..695T. doi:10.1051/0004-6361:20065602. ISSN 0004-6361. ↑ 6.0 6.1 P. A. Wiegert; M. J. Holman (1997). "The stability of planets in the Alpha Centauri system". The Astronomical Journal. 113: 1445 – 1450. arXiv:astro-ph/9609106  . Bibcode:1997AJ....113.1445W. doi:10.1086/118360. ↑ 7.0 7.1 7.2 7.3 7.4 7.5 7.6 7.7 Thévenin, F.; Provost, J.; Morel, P.; Berthomieu, G.; Bouchy, F.; Carrier, F. (2002). "Asteroseismology and calibration of alpha Cen binary system". Astronomy & Astrophysics. 392: L9. arXiv:astro-ph/0206283  . Bibcode:2002A&A...392L...9T. doi:10.1051/0004-6361:20021074. ↑ 8.0 8.1 Kervella, P.; Bigot, L.; Gallenne, A.; Thévenin, F. (January 2017). "The radii and limb darkenings of α Centauri A and B. Interferometric measurements with VLTI/PIONIER". Astronomy & Astrophysics. 597. A137. arXiv:1610.06185  . Bibcode:2017A&A...597A.137K. doi:10.1051/0004-6361/201629505. ↑ 9.0 9.1 Gilli G.; Israelian G.; Ecuvillon A.; Santos N. C.; Mayor M. (2006). "Abundances of Refractory Elements in the Atmospheres of Stars with Extrasolar Planets". Astronomy and Astrophysics. 449 (2): 723–36. arXiv:astro-ph/0512219  . Bibcode:2006A&A...449..723G. doi:10.1051/0004-6361:20053850. libcode 2005astro.ph.12219G. ↑ 10.0 10.1 Kervella, P.; Thévenin, F.; Ségransan, D.; Berthomieu, G.; Lopez, B.; Morel, P.; Provost, J. (2003). "The diameters of α Centauri A and B". Astronomy and Astrophysics. 404 (3): 1087–1097. arXiv:astro-ph/0303634  . Bibcode:2003A&A...404.1087K. doi:10.1051/0004-6361:20030570. ISSN 0004-6361. ↑ 11.0 11.1 E. E. Mamajek; L. A. Hillenbrand (2008). "Improved Age Estimation for Solar-Type Dwarfs Using Activity-Rotation Diagnostics". Astrophysical Journal. 687 (2): 1264–1293. arXiv:0807.1686  . Bibcode:2008ApJ...687.1264M. doi:10.1086/591785. ↑ Pourbaix, D.; et al. (2002). "Constraining the difference in convective blueshift between the components of alpha Centauri with precise radial velocities". Astronomy and Astrophysics. 386 (1): 280–85. arXiv:astro-ph/0202400  . Bibcode:2002A&A...386..280P. doi:10.1051/0004-6361:20020287. This page wis last eeditit on 29 Mairch 2018, at 05:26.